Looking to buy a candy filled Easter basket that is extra large ? Check out our ultimate Easter basket. This is filled with enough candy for the whole family to share ! 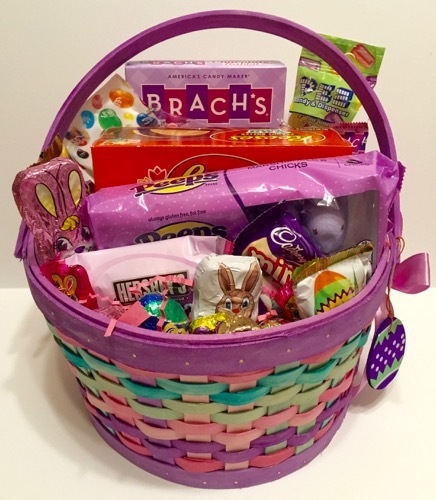 This Easter baskets is filled with all the favorite Easter candies. You get a large Reese's egg , a Brach's solid chocolate bunny, Pez and refills, Hershey marshmallow eggs, Cadbury mini eggs, chocolate eggs and bunnies. Of course you have to have peeps and jelly beans every Easter basket needs them. Along with other Easter favorites. So if you are planning on getting an Easter basket for a family or one that just loves candy. Buy this Easter basket, there is something in it I am sure will please everyone in the family. Please not that the style and color of the basket may be different due to availability , but all the candy will be the same.